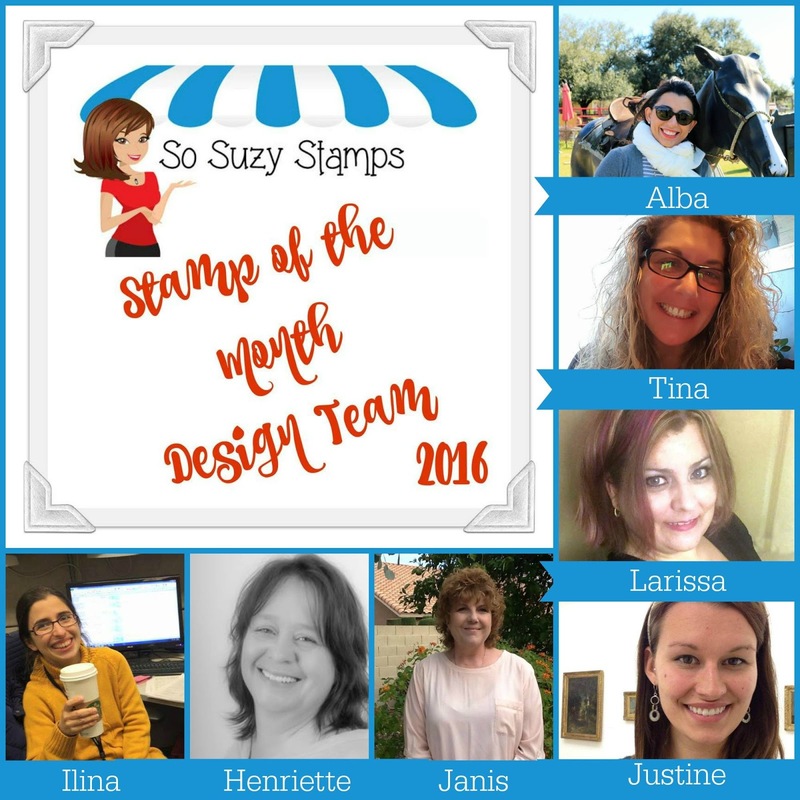 Introducing Our New Stamp A Month Design Team! 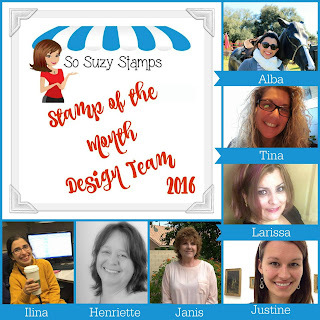 Our Stamp a Month Club Design Team is growing and I am excited to introduce you to our new team that will be showing off their crafty skills on May 10th with the May Stamp A Month! If you haven't signed up yet, please head on over to the website and secure your kit! My name is Justine. I have been with So Suzy since the very beginning. I am Canadian, originally from Thunder Bay but I live in Edinburgh, United Kingdom. I studied French and Education and I am a teacher. I moved to Europe to be with my partner in crime. In my spare time, I am usually blogging, making videos for my YouTube channel or reading. Hi, I am Ilina Crouse. I am from Macedonia, but have been in the US for over 11 years. Currently I live in Atlanta, GA. By day I am an Electrical and Proposal Engineer, by night I am an avid paper crafter. I am a wife of 11 years to my wonderful husband, Sean, and a mommy of 3 little ones (Anna - 4yr, Milena - 2yr and Jason - 14 months). I love Clean and Simple designs and try to create every day, as my little escape from the everyday craziness. I love coloring and trying and experimenting with different techniques. Hi, I’m Henriëtte van Mierlo, 47 years old. I live in The Netherlands with my boyfriend Robert and my 15 year old daughter Emma. I work in financial administration and in my spare time I love to craft, especially cardmaking. I’ve been making cards for many years, starting with 3d cards (learning by watching my mother make those) . Nowadays I like to make clean and simple style cards using all kinds of cardmaking techniques. I color my stamps not only with alcohol markers and watercoloring inks but also digital in Photoshop (a magical tool). Other hobbies I like are making cute things with polymer clay or felt (kawaii style), watercoloring, making nylon flowers and reading books (mostly travel stories). I’m Larissa Pittman and I live in a small town in the Texas Hill Country. I’ve been creating all my life in some way or another; however, my passion is for card making. I love anything and everything to do with the Art world and trying new mediums. I’m so excited to be a part of So Suzy Stamps DT. I hold a degree in Graphic Design as well as a State of Texas Certification as an E.M.T. and Nail Technician. I’ve am married and have a 25 year old daughter and 2 furbabies. When not in my studio creating, I enjoy spending quality time with my husband, daughter, family and friends. I also love cooking and baking from scratch and watching a little TV. I’m Janis Ford. I live in New Mexico, and am fairly new to the card making world. After many years of working in the mining industry, I was fortunate enough to be able to take early retirement, and now have more time to devote to making cards and learning new techniques! I have a wonderful husband, three adult daughters, and three precious granddaughters who hold the key to my heart! I enjoy reading, baking, and traveling - mainly to visit my grandchildren. I’m Tina and I am a graphic artist/designer. I am married. I have a son whose all grown up. I started scrapbooking in Sept. 2008 and then stamping in April. 2009 but it wasn’t until 2010 that my style of card making changed. I am always trying out new techniques so my style is always evolving, however, one thing never changes...I love to fill my page. If you are like me then you are as addicted to paper, dies, inks, embellishments, stamps & so much more. I have been fortunate to be published in several magazines, such as Canadian Scrapbooker & Scrapbook Magazine as well as online pubs such as ReadySetCreate and Scrapbook News & Review. I am so excited to be on the So Suzy Stamps DT and look forward to this new chapter. Hi, I’m Alba, I am originally from Venezuela but have been living in Texas for 14 years with my husband and 2 boys. I have been an avid crafter since I was a kid, but I felt in love with paper crafting since I made a scrapbook for my husband on father’s day few years ago, after that, I started exploring the handmade cards world and I have loved it since then, I think a handmade card is a very unique way to show others how much you care and think of them. I work as an auditor by day and craft by night, my favorite medium is watercolor but I also enjoy other mediums, I also enjoy beading on my spare time. I am so thrilled to be part of this incredible team and cannot wait to show you our creations! Please join me in welcoming our new ladies and don't forget to join us in our special SAM Facebook Group to see everyone's creations! Hi Moira 😊, thanks so much for stopping by to say hello! Ffhi Moira,nnice to see ya! LoL! Bienvenida Alba, qque bueno ver a otra venzolana aca chica, yo tambien soy venezolana! Welcome evryone to So Suzy nut house, you guys know that you cannot leave now! You guys have no idea what you are into! Hello everyone. I'm looking forward to seeing all you beautiful cards.